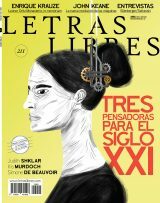 From its beginnings, Letras Libres has had a clear cosmopolitan vocation. Such a vocation is based on the belief that, in a globalized world, where the international political, economic and social agenda, and, in particular, the cultural agenda have become general, it is essential to develop an open reflection capable of fostering new reflections in which it will, at the same time, feed itself. Thus, with humility but in an ambitious way, Letras Libres aims at becoming a bridge between cultures, a tool for dialogue between countries and continents.